This offer is valid for check-in dates from May 3 to 5 and May 10 to 12, 2019 with check-out date on or before May 13, 2019. This offer is applicable for Standard Room in Disney Explorers Lodge or Disney’s Hollywood Hotel (each a “Hotel”) only. Actual package price depends on the check-in and check-out date, the hotel and room category selected, the prevailing room rate, the number of staying Guests in the group and the respective ages of the staying Guests (subject to availability and any Benefits Limits, defined in the Hotel General Terms and Conditions). The prevailing room rate for each Hotel is determined at the time of booking. Subject to Paragraph 4 above, each Hotel Room can accommodate up to a maximum of 4 Guests. At least one adult must be a staying guest in each Hotel Room. A deposit equivalent to the price of the package will be charged to your payment card account in 48 hours. Our Cast Member will contact you if there is any issue with payment. If payment is unsuccessful 48 hours after your online reservation, your reservation may be subject to cancellation. Guests are not allowed to cancel or modify a reservation once it is made. Any cancellation or modification will be subject to a charge equivalent to the full price of one package. Such charge will be deducted from the deposit. Each Guest may reserve a maximum of 1 room-night package in each transaction. 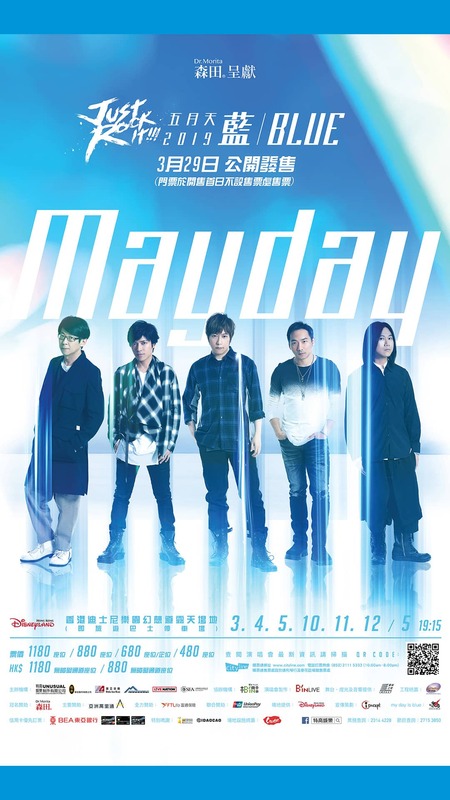 Tickets of Dr. MORITA presents MAYDAY JUST ROCK IT 2019 BLUE (the “Event”) must be collected in person by the Guest who purchase this offer upon Hotel check-in. Event tickets issued under this offer are not for re-sale, are non-transferable, non-refundable and non-exchangeable, either in whole or in part, for cash or any other items. Seats are allocated on a random basis, subject to the seat section of the Event ticket and shall be determined by HKITP in its absolute discretion. Any change request of seat arrangement will not be accepted. HKITP shall not be responsible for (and will not issue replacement in respect of) any loss, damage, forgery, theft or fraudulent or unauthorized use of any Event tickets. HKITP’s record in relation to issue of Event tickets shall be final and conclusive. Show dates and times of the Event shall be determined by the organizers of the Event in its absolute discretion. The Event organizer reserves the final right to vary the show dates, times or cancel the show at any time without prior notice. Event tickets are issued on behalf of the Event organizer. Guests shall liaise and contact the Event organizer directly for any arrangements in case of Event cancellation or postponement. HKITP shall not be responsible for arranging or any ticket refund. Subject to the terms and conditions printed at the back of Event tickets, Rules and Regulations of the Event available on Event organizer’s official Facebook Page and other restrictions and changes determined by the Event organizer in its sole discretion without advance or further notice. Guests who purchased valid concert tickets held at Hong Kong Disneyland Resort may enjoy an exclusive set menu at HK$168 (plus 10% service charge) at Walt’s Cafe (Hong Kong Disneyland Hotel), Studio Lounge (Disney's Hollywood Hotel) or World of Color Restaurant (Disney Explorers Lodge). Concert tickets must be presented at the time of ordering. The designated period of this offer is from 16:30 to 18:30 and subject to availability. Advance reservation is required and specify the usage of this offer at the time of reservation. Please call Walt’s Cafe (+852 3510-6000), Studio Lounge (+852 3510-5000) or World of Color Restaurant (+852 3510-2000) for enquiry and reservation. HKITP reserves the right to determine the prices of the food and beverage and the operating hours of the restaurants in its sole and absolute discretion. In the event of dispute, HKITP reserves the right to make final judgment on the dispute and otherwise in respect of this coupon. HKITP reserves the right to amend or supplement these terms and conditions applicable to the Coupons, the Offer or to terminate or suspend the availability of the Offer at any time without any prior notice. These terms and conditions shall be governed by and construed in accordance with the laws of HKSAR.